Andrew Hughes scores for Posh Reserves against Newport at the ABAX Stadium. Photo: Joe Dent/theposh.com. Defender Andrew Hughes scored twice for Peterborough United reserves against his former club Newport County in a Central League game today (April 11). Hughes opened the scoring on 11 minutes from a Lewis Freestone cross, but the visitors to the ABAX Stadium equalised within two minutes through Momodou Tourey. Club captain Chris Forrester in action for Posh Reserves against Newport. Photo: Joe Dent/theposh.com. Paul Taylor shot a strong Posh side back in front on 26 minutes following another cross from impressive left-back Freestone and early in the second-half Hughes made it 3-1 from a corner. Lewis Collins pulled a goal back for Newport before Posh substitute Morgan Penfold saw his penalty saved after another replacement Andrea Borg had been upended. A Taylor cross led to an own goal from Jay Williams before Borg headed the final goal from close range two minutes from time. Posh fielded a trialist goalkeeper in each half and also a trialist midfielder who created the final goal. 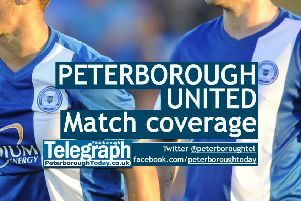 Posh: Trialist (sub Tralist), Hart, Freestone, Hughes, Goode, Inman (sub Nabi), Chettle, Forrester (sub Trialist), Nicholson (sub Borg), Nichols (sub Penfold), Taylor.